The Wyoming Legislature budget process is broken and needs to be fixed. One of the serious problems with the process enabled the tossing out of science standards and months of work by the Wyoming State Board of Education with 10 minutes of debate in a single house of the Legislature without any input from the public. Some will argue that this was the correct outcome, but no one can disagree that the process that brought us here was flawed. It was the afternoon of February 21. 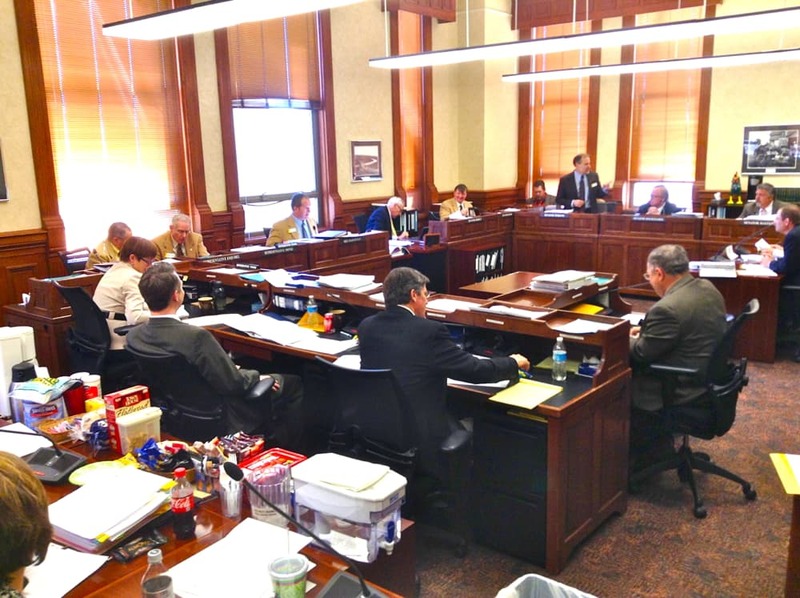 The House and Senate were working on the third and final reading of the Budget Bill, a big, long document that contains funding for all of Wyoming government for the next two years. The Budget Bill was developed by the Joint Appropriation Committee in a progression that had started more than two months earlier in the first part of December — a process known for its many hours of testimony from bureaucrats and very little input from the public. The Representatives were wearing down after an exhaustive series of discussions on a far range of issues. It had been a long week and the budget had occupied most of four very tiring days in a complicated dance that was occurring at both ends of the Capitol at the same time. In a special procedure reserved only for the Budget Bill, the House and Senate addressed the legislation simultaneously. During previous days of debates, 83 amendments, many representing substantive changes in policy, passed, failed or were withdrawn by their sponsor. Another 50 amendments were in the hopper that day and it was now the last afternoon of the last day of budget floor debate. After a series of deliberations on various amendments, the Presiding Officer recognized the Chairman of the House Education Committee who boldly strode to the microphone and offered Third Reading Amendment Number 14, amending page 88 of the 178 page budget. The Chairman argued that Next Generation Science standards improperly considered global warming and did not suitably reflect the possibility for creation theory. Just under 10 minutes later, after brief statements from a total of eight, no doubt very tired, Wyoming Representatives – two Democrats and six Republicans with four in favor and four against — it was over. The amendment passed with 39 legislators standing in favor upon a call for division. We do not know how individual legislators voted, as in contrast to a stand-alone bill, a recorded vote did not occur on that specific amendment. After many more hours of work in other areas as well, the Conference Committee sent the compromise budget to both houses for approval and the House of Representatives and Senate each held a single vote on the compromise version of the entire exhaustively-developed Budget. The budget process does not permit anyone to divide out objectionable portions for a separate vote. Once the compromise budget was passed by both Houses, the enrolled act was sent to the Governor who had three days to exercise his veto powers, which on bills containing appropriations, includes line-item-veto power. 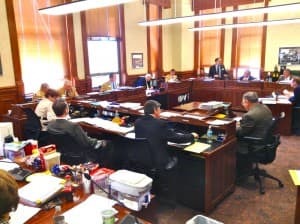 Amendment 14 as modified by the Conference Committee escaped the Governor’s veto pen. I have been around a while, even serving 4 years on the Appropriations Committee, and working the budget has always been a tough job. Prior to adopting the mirror budget process, the budget bill proceeded through one house and then the other. This was a better way for the public to have access and it allowed better scrutiny of the work being done. It was less likely that the budget would be Christmas-tree’d with legislation that more properly belongs in a stand alone bill. Article 3, Section 20. No law shall be passed except by bill, and no bill shall be so altered or amended on its passage through either house as to change its original purpose. Article 3, Section 23. No bill shall be considered or become a law unless referred to a committee, returned therefrom and printed for the use of the members. Article 3, Section 24. No bill, except general appropriation bills and bills for the codification and general revision of the laws, shall be passed containing more than one subject, which shall be clearly expressed in its title; but if any subject is embraced in any act which is not expressed in the title, such act shall be void only as to so much thereof as shall not be so expressed. Article 3, Section 25. No bill shall become a law except by a vote of a majority of all the members elected to each house, nor unless on its final passage the vote taken by ayes and noes, and the names of those voting be entered on the journal. Article 3, Section 34. The general appropriation bills shall embrace nothing but appropriations for the ordinary expenses of the legislative, executive and judicial departments of the state, interest on the public debt, and for public schools. All other appropriations shall be made by separate bills, each embracing but one subject. Amendment 14 should have been considered as a stand-alone bill. It should have been through a committee in each house where the public is allowed to testify and the committee is able to spend sufficient time to learn all the ramifications of the proposed legislation. It should have been considered in both houses sequentially and a recorded vote from each member taken on final passage in each house. By tacking it onto the Budget Bill, none of these checks and balances happened and the proud Wyoming Legislature slipped a little bit closer to emulating one of the worst aspects of Congress – bills with more than one subject that can increase the tendency towards log rolling or vote trading. Legislators end up not opposing the budget because, as bad as it is, it has more good in it for their constituents than not. As a result everyone tends to vote yes and government grows and includes programs of dubious value. There are also Constitutional requirements related to how the Legislature handles education. One of the sections specifies that the legislature shall not specify “textbooks” — this was the curriculum speak of its day. Another says that schools should not be “sectarian.” Always it is shades of gray, but arguably these provisions were relevant to the issue and were not covered in the limited forum of the debate on Amendment 14. Article 7, Section 11. Neither the legislature nor the superintendent of public instruction shall have power to prescribe text books to be used in the public schools. Article 7, Section 12. No sectarian instruction, qualifications or tests shall be imparted, exacted, applied or in any manner tolerated in the schools of any grade or character controlled by the state, nor shall attendance be required at any religious service therein, nor shall any sectarian tenets or doctrines be taught or favored in any public school or institution that may be established under this constitution. If Amendment 14 was a stand-alone bill in a legislative committee where public testimony and discussion is allowed, these arguments would have been able to be advanced and debated more thoroughly. I am not saying that budget Christmas-treeing doesn’t happen all the time, or that I haven’t engaged in a bit of it myself. From a strategy perspective as a legislator, this has been a great way to circumvent the 2/3rds vote required for non-budget bills in a budget session. But the real answer is for all of us to develop rules in compliance with the Constitution and to follow them. First, let’s get rid of the mirror bills for the budget and even more radically start allowing public testimony in the budget hearings. Next, let’s stick to the strict use of the budget as a funding and not a policy vehicle. Finally, let’s consider adding a way for each house to reject aspects of the Budget Compromise that fall outside of constitutional sensibility and send the Committee back with a limited mandate. The mirror budget process was adopted to save time, but it really doesn’t. It still takes four days dedication by each house. That would not have to change, only that the days would not be simultaneous. And if we toe the line on Christmas-tree amendments, folks will quit offering them and the time required for the budget could drop dramatically. The current mirror bill process failed us. It failed the people of Wyoming, and it failed the good people of the Wyoming legislature. This needs to be fixed. — Senator Cale Case represents Wyoming Senate District 25, which includes his hometown of Lander, the Wind River Indian Reservation, Hudson, Atlantic City, a small portion of Riverton and vast parts in between. Cale is an economist and consultant with a PhD from University of Wyoming. He has served in the Wyoming Legislature for 22 years. This is a great explanation, Sen. Case. Thank you. I’ve finally gotten around to reading it! Thanks for taking the time to put this primer together and also offer some very pragmatic solutions. Your proposals make a whole lot of sense to me. Thanks to Senator Case and to the previous commenters for shinning light on the distance between what we have and what might be. I’m left wondering again at the needs and fears which motivate elected and appointed officials, to say nothing of the public, who tolerate the narrowness and poverty of spirit exemplified by Wyoming Board of Education Chairman Ron Micheli who said “the discussion of climate change … has to be … based on the economy of this state.” (Casper Star Tribune, 4/11/14, State Board Sends Science Standards Back to Education Department) Is this the history we want to make in Wyoming? And take heart, you Galileos out there. Sen. Case is exactly right about the procedural problems with this footnote, but he misses one other candidate for criticism. That is the budget bill conference committee, which was complicit by trying to make the footnote palatable. I know the members had many important amendments to deal with, but that’s no excuse. Further criticism is due for the governor, who had plenty of reason to veto the footnote but chose not to. The footnote amendment was an ambush: a few people blowing past the deliberative process and public debate, exploiting a committee chairman who is supposed to be trustworthy. In fact, the science standards were ready to go out for public comment when the footnote stopped everything in its tracks. So people who contend they just wanted a chance to be involved are either dishonest or ignorant. Sen. Case raises the issue of constitutionality. I don’t know about that, but the Legislature has become more and more aggressive in using the budget process to micro-manage the Executive Branch. That should stop. The solution is a bill on the first day of the 2015 session, signed by the governor and effective immediately, to repeal the footnote. Well said! Footnote amendments to the budget bill bypass the full legislative process of committee and floor debate and voting in both chambers. Let’s do away with this irresponsible process! Well written. A few years ago I was quoted in a newspaper that this very issue was a “poor way to do business” following a budget footnote proposed by a senator who blessedly is no longer in the legislature. All that got me was a phone call from that senator who berated me that it was a common way for legislators to do business. I wholeheartedly support Senator Case and his essay. Hopefully it will be resurrected before the next budget session and some pressure exerted to correct the “way business is done” in the legislature. Thanks to Sen. Case for his insightful commentary on what went wrong. Well said, Sen Case. Circumventing the top scientific professional groups in the country because some ignorant, possibly uneducated conservative hack of a politician doesn’t understand science is no way to legislate. This is clearly an issue of religious fanatics gaming the system and getting their way in our conservative legislature to the great detriment of our citizenry. Wyoming students will continue to fall further behind their counterparts if we insist on this type of head-in-the-sand approach to science. Senator Case and I do not always agree on policy matters but in this case I agree 100% with his proposals. There are many Wyomingites who think the last minute tossing out of the science standards was a procedural short circuit as well as a denial of access to the decision making process for those who want, support and appreciate a full balance of educational teaching for Wyoming children, youth and young adults. Many young people will go to the ends of the earth (e.g. they will leave Wyoming) to learn the full measure of truth, which is the opposite result wanted by most.